Yes, our second album is finished. A tad more than ten months after the first one was released, seems pretty good to us- all things considering… The whole enchilada is available for your listening pleasure. Physical release will be in a few weeks and the album should be available on iTunes et al around the same time. Stay well and warm everybody! The birth of The Bias can be traced to late 2010. It was then that Jaakko and Ville Vilpponen, accomplished musicians in the San Francisco scene, recruited Mina Elliott on bass for their long running project known as Antenna. The resulting line-up performed their first show in the turn of the year and soon started to build a reputation for themselves as a not-to-be-missed live act around the Bay Area. Still called Antenna, their first single as well as a tour of the East Coast and Eastern Europe followed the next spring. 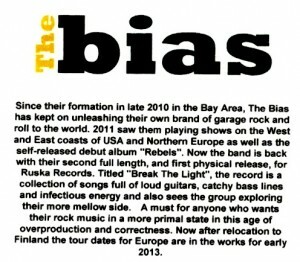 After recording and mixing their debut album in summer/fall of 2011 the band changed their name to The Bias. “Rebels” will be released digitally in November 2011. 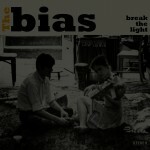 The Bias plays music that mixes the energy and rawness of 60s and 70s garage rock with more modern sense of atmospherics. It’s something you want to experience for yourself. So make sure you buy the album, see a show and tell your friends what they’re missing out on.